made a career in Hollywood writing for The Tracey Ullman Show and producing for Nickelodeon, has written a series of books that explores how kids can take control of their careers – both in real life and through fiction. In “real life” Baron, who is also a graduate of Harvard Business School, goes into public schools in Manhattan, Westchester and Los Angeles to discuss the reality of Hollywood. With these elementary and middle school students, Baron shows how Sean Rosen gets a meeting, pitches a project, negotiates a deal and becomes his own manager. Students use Baron’s fictional character as a guide, ask questions and sometimes practice pitching projects. In Baron’s fictional books series with HarperCollins, protagonist Sean Rosen “has a sparkle in his eye, a lot of ideas – most of which are much better than what’s currently on television – and is not happy to passively wait for Hollywood to call him on the family landline. 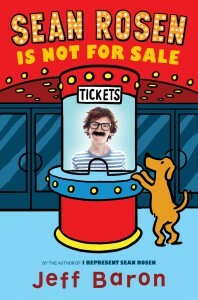 His latest book, Sean Rosen is Not For Sale, is out this month from Harper/Collins/Greenwillow. “Sean Rosen is not just a character in our seventh grade classroom, he is a real person. We talk about him: What would Sean do? We laugh with him: I want a donut too! We dissect him: How did he figure out how to do that? Sean might as well have a desk in the back – no, he would sit in the front – of our classroom, right? We would really enjoy that. “Jeff gave my students the chance to see the writing process first-hand. He was open and honest, much like Sean, about his process; this allowed students to see that writers don’t just magically produce a novel – it takes work and revision and most of all, feedback from others. Jeff let us into his world – he talked to us about how he developed some of his characters from real-life people; he shared his struggles; he explained his intentions behind not giving away too much about what each character looks like, so the reader can imagine some of this himself. Someone said, ‘Sean is tall and lanky,’ Someone else said, ‘Sean must look like my brother.’ Each student has some personal vision of Sean Rosen. Jeff Baron hopes to give kids a leg up by teaching them how Hollywood really works. I also had the opportunity to interview Jeff Baron himself. PP: How did you go from writing for television and theater to writing books for kids? 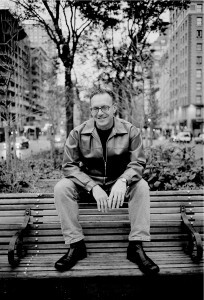 “I started writing the book in the first person as Sean Rosen, and once that 13-year old started talking, he never stopped. It was very easy to write the book, especially after having written for television and four original screenplays (all of which were sold, to Disney and Oscar-winning producers, but never made into films). Writing in the first person is very similar to writing dialogue, or in this case, a very long monologue, peppered with transcripts of conversations Sean records with his digital voice recorder. Also, when you write funny stuff, you know when it’s working, because you’re laughing as you write. I worked on it in spare moments on trains and subways. I was the laughing guy scribbling on a yellow pad. “Because Sean, the narrator, was a contemporary seventh grader, I thought I’d better do a reality check so I asked Edgar McIntosh, the principal of Ardsley (NY) Middle School, someone I knew socially, if I could come to his school and read some chapters for actual kids, to see if those kids believed my kid. I didn’t know this then, but this is a school that highly values writing, and Edgar set up an afternoon of readings for me with seventh grade English classes. “The students totally bought Sean and they also enjoyed the fictional characters that Sean created for his pitches to Hollywood. Their feedback gave me confidence to move forward. Then I had my 12-year old cousin read the whole book, and seeing that he got it and appreciated it in every way I want every reader to get my work, I was sold. I’m still a little sad that adults who would love the book might not find it because it’s in the kids’ section, but I am very happy that kids are reading it. And why DO kids need to get in control of their career. How do you suggest that they do that? “When I wrote this book, I had not spent much time with kids. I thought a kid launching a career at 13 was a bold idea. What I quickly learned is that I’ve unexpectedly tapped into the zeitgeist. Virtually every kid I have met, even kids younger than Sean Rosen, has gigantic ambitions. Everyone wants to be a viral, global brand, and make as much money as possible. In that way, Sean is a little bit different – he turns down studio offers if he thinks his artistic vision will be compromised. It’s been very interesting talking to kids about Sean’s decision. It feels like the first time most kids have heard of anyone doing that. It reminds me of when my dad was promoted to manager of the clothing store where he worked. After a week, he asked for his old job as assistant manager back. The extra money wasn’t worth it to him. As an ambitious kid, that impressed me. “But meanwhile, I seem to have created a how-to book for a generation of players. Because Sean doesn’t tell his parents about his Hollywood career, he has to figure things out himself, and kids like that about him. He tried other ways to break into the entertainment business, but they didn’t work. He had to invent his own manager. The books get into specifics about bidding wars and deal points, and kids, even third and fourth graders are very, very interested. “I suggest to kids that they pursue their dreams, but I try to give them a discipline. Sean Rosen walks the walk. He has ideas and he sees them through, starting with his video podcasts (which are actually online on YouTube and SeanRosen.com). Readers of the books as well as the Hollywood execs that Sean is pitching can actually see his work. And Sean tells us his process. And finally, is there anything else you’d like to talk about – either about your speaking to schools, your writing? “Like Sean Rosen, I love to write and to come up with ideas and see them through. My adventures in Hollywood, which inspired these books, were often very frustrating. I write to communicate with a broad audience. With my movies, I only got to communicate with studio executives. With TV, because of the nature of the process – all those producers you see in the credits are writers who rewrite your work without consulting you – my work reached the public, but in a randomly edited form. In theatre, my plays are performed as written, but as ticket prices go up, the plays naturally become for a more and more elite audience, most of whom are over the age of 50.